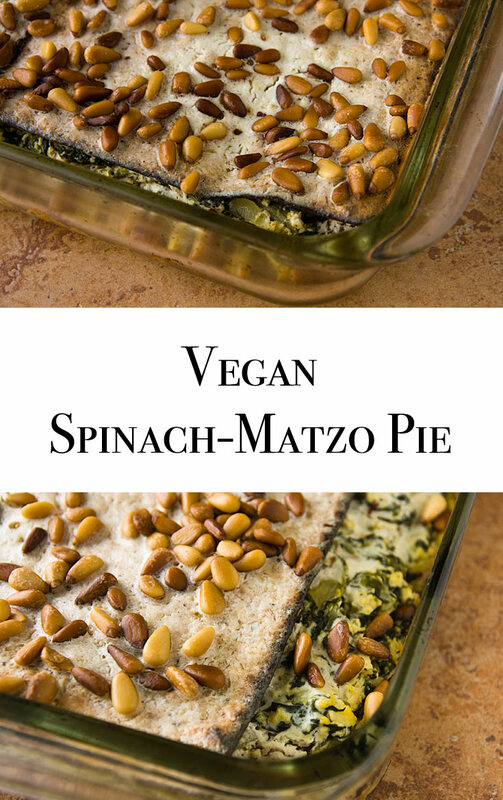 When I saw the Spinach and Matzo Pie recipe in this month’s Gourmet, I thought, “Wow, an easier way to make a spinach pie! No fooling with thin sheets of phyllo, just lay down some matzos instead.” I figured it’d be a snap to take my Spinach and Artichoke Pie and just substitute matzos for the phyllo. But then I read the recipe. 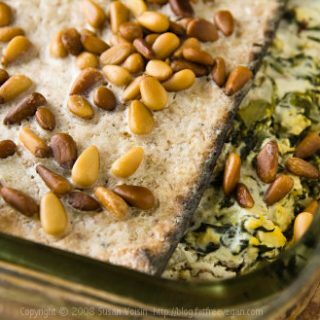 Since matzos are on the dense side, the Gourmet recipe would have you soak them in a mixture of cottage cheese, whole milk, and eggs for 15 minutes before picking them up and layering them in the baking dish. Never mind that I wasn’t planning on using any of those ingredients; I just couldn’t imagine picking up soaking wet matzos, which are basically thick crackers, and being able to transfer them intact to the baking dish. But since there wasn’t that much liquid in my original recipe, I also couldn’t imagine them getting soft enough if I didn’t add some more moisture. In the end I wound up with a recipe that bears little resemblance to either Gourmet’s recipe or my old recipe. Instead of cottage cheese and eggs, I used a mixture of Toffuti cream cheese and soymilk, and instead of the feta that tops Gourmet’s pie, I used pine nuts. I stuck with the seasonings of my original recipe–oregano and cumin–and skipped the dill in Gourmet’s (besides the fact that we’re not big fans, I had no fresh dill on-hand). The result is this delicious, though not really easy-to-make, main dish. The addition of vegan cream cheese and pine nuts takes this out of the realm of low-fat eating and right into feast-food territory. If you want to cut the fat, I suggest sticking with my Spinach and Artichoke Pie. Or, if you want to avoid the problem of soaking the matzos altogether, try using matzo meal instead and skip the Tofutti mixture. For a gluten-free version, try using either gluten-free bread crumbs or crackers. I should also mentioned that though the Gourmet recipe was kosher for Passover, this one is not: The soy products make it off-limits for anyone observing the Passover dietary laws. (I took this to a Unitarian-Universalist Seder where, like most things Unitarian, anything goes.) I was unable to get a photo of it once it was cut, but you can see an important detail in the photo below: the matzos don’t reach all the way to the edge of the pan, so keeping it intact after cutting is nearly impossible. For a beautiful presentation, phyllo dough wins hands-down. Packaged vegan cream cheese makes this special occasion dish very rich. Heat a non-stick pan. Add onion and cook until translucent, about 3 minutes. Add the garlic and spinach and cook, stirring, until hot. Then add 1/2 of the Tofutti and 1/4 cup milk, stir until well blended, and remove from heat. Put the remaining Tofutti into a blender along with the rest of the soy milk and the nutmeg. Blend until smooth. Set aside. Mash the tofu well with a potato masher. Add the nutritional yeast, oregano, lemon juice, kalamata olives, cayenne, and cumin. Mix well, then add it to the pan with the spinach. Stir until combined and then add salt and freshly ground pepper to taste. Preheat oven to 400F. Lightly spray a 9×13-inch baking dish with non-stick spray (parchment paper may also work). Place two of the matzos in the bottom of the baking pan. Pour about 1/4 cup of the Tofutti mixture over them and use a brush to coat the matzos well. Cover with half of the spinach. Put two more matzos over the spinach, coat with another 1/4 cup of Tofutti mixture, and top with remaining spinach. 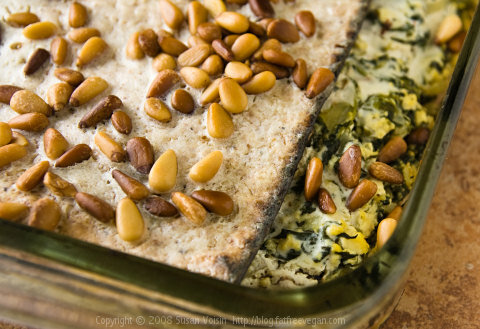 Put the final two matzos on top, cover with the remaining Tofutti, and sprinkle with pine nuts. Bake uncovered for about 20-30 minutes, until golden and set. Cool for 10 minutes before cutting and serving. You’re very creative! It looks really yummy. Well, Susan, it looks yum. It is hard to beat phyllo for a beautiful presentation, though. You never know until you try! Hello! I’m a first time commenter but I love your blog, and the recipes are great! One of my recent favorite recipes is your Coconut Chai Breakfast Cake…it’s amazing. I’m making a non-vegan matzah lasagna tonight, so I’ve given this some thought! And, just cause I’m here already, my favorite recipe is the chocolate peppermint pudding recipe you posted back in March of last year, it has inspired me to make other tasty vegan pudding! And ps: I eat dairy but a cottage cheese, whole milk & egg mixture sounds gross…glad you went with the Toffuti cream cheese & soy milk instead! What a lovely bake. I only crunch on matzo, never cook with them. You re very innovative, Susan. We don’t really have matzo in Belgium. One of the most creative matzo recipes I’ve ever seen! And it actually looks tasty, too 😉 . I have never seen this matzo stuff in squares-only in powdery form you add water to and make balls. where do I get this in small town Michigan and what does it taste like? this looks so good. I wonder what I could use instead-I don’t care if its all fat either! i love my spinach! I love your blog for always introducing me to new foods I’ve never heard of before! Next time I’m at the market I must keep a lookout for matzos! Great Recipe! I made it last night and all my roomates who usually stear away from my crazy vegan dishes couldn’t get enough. One thing I did change, however, was adding greek seasoning to the tofu mix. It was delicious! Also, quick note. In the recipe, I think you mixed up, Tofutti mixture with tofu mixture…so at the end I realized I had a whole bunch of mashed tofu and I still hadn’t put it into the pie. Just a heads up, you may want to clarify that in your recipe. Other than that, hat’s off! I’m a recent reader of your blog and you have definetly inspired me! Nichole: Hmmm. I’m not sure how you got confused. The tofu goes into the spinach, so after that it’s called the spinach mixture. The Tofutti/soymilk blend is always called the Tofutti mixture. Glad you enjoyed the recipe anyway. I think you’ll like it much better if you mix the tofu with the spinach! oh! Haha, I went back and re-read the recipe and yup you’re I had skipped over that part. As yummy as it was, I’m sure I missed out a lil by having it all sit near the top. Oh well! Next time! I am looking for some vegan Passover recipes. I’m celebrating for the first time. My mom’s family is of Jewish descent, but we’ve never been strict about it. Are there any vegan Passover dishes without soybeans or legumes? I’m looking to find something a little more traditional. Side note: depending on ancestry, some Jews do eat legumes and grains other than the 5 major grains (wheat, rye, barley, oat, and spelt) during Passover. As a vegan of Ashkenaszi decent, I follow the less restrictive Sephardic traditions during Pesach or I wouldn’t be able to eat much if rice and beans were off the table as much as leavened products. 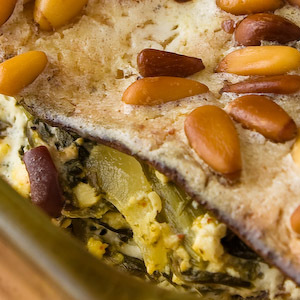 Where is your fat-free vegan lasagna that you had around just after Passover? I cannot seem to find it anywhere and it was the best lasagne I ever tasted! And it was fat-free! Linda, is this the one you mean: https://blog.fatfreevegan.com/2006/03/my-favorite-lasagna.html I have a couple of recipes for lasagna, but this is my most popular one. A huge hit at our 30-person seder in 2015 & will be making a repeat performance this year (2016). Everyone had seconds & the dish was completely gone. I had also made a non-vegan spinach mina with (feta, egg, ricotta, etc), using a recipe from Epicurious, and YOUR version was much more flavorful and preferred. We had lots of the dairy one left over. This year, we’re using only your version and tripling the recipe!